Many computer users like to decorate and personalize their computer by adding their favorite images as the wallpaper or desktop background on their computer screen. New parents like to add their newborn or family photos while motor sports fans prefer to put motorcar images on their computer screen. Constantly changing wallpaper is definitely one way to make the dull computer screen look stunning and exciting. 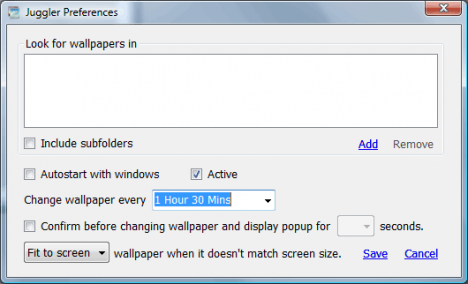 However, to manually change or replace the wallpaper on a regular basic can be very tedious. You need to find the images, modify their sizes, upload them, etc. To make life easier, Wallpaper Juggler can automatically help you to download high-resolution images, upload as your wallpaper, and rotate the wallpapers regularly so that the screen always looks updated and interesting. 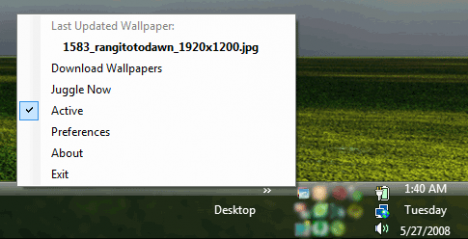 Wallpaper Juggler is a free application that runs on Windows XP, Vista and even Windows 7. However, users need to install .NET 3.5 prior to the installation of Wallpaper Juggler. The app can adjust the image position and resize the image to fit the Windows screen. Users can configure the app and decide how frequent they want the wallpaper changes. Another interesting feature of Wallpaper Juggler is that the app allows users to download stocks of wallpapers from InterfaceLift.com and WallpaperStock.com. Runs in background and can be controlled from System Tray. Can be configured to:(a)start with Windows;(b)look for wallpapers in multiple folders including/excluding subfolders, best results when used with matching resolution wallpapers;(c)change wallpaper once every preferred duration between 1 min and 500 hrs. It will understand “000 Hrs/Mins 000 Min” format. It can interpret M/Min/Mins/Minutes and H/Hr/Hrs/Hour as Minutes and Hours respectively. (d) confirm before changing wallpaper. (e)adjust image positioning for odd size wallpapers. Users can also change wallpaper manually by clicking ‘Juggle Now’ menu or double clicking on the icon. Allows only one instance at a time. Displays the last updated wallpaper and the time stamp when the next change will occur. “Active” option to enable/disable wallpaper juggling while program is running. Last changed wallpaper is a clickable menu which opens the wallpaper in windows explorer. It downloads striking wallpapers from interfaceLIFT.com and WallpaperStock.com using “Download Wallpapers” screen. Download Wallpaper Juggler via the link here.